The folks at Capcom USA recently took to the streets of New York City in an attempt to raise awareness about the release of Okamiden. 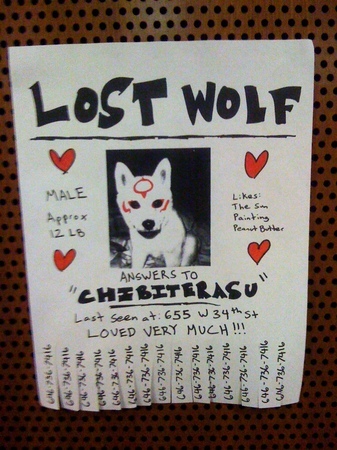 Will the following poster prompt New Yorkers to run out and purchase a copy of this chibi-fied Okami sequel when it's released stateside in late March? I'm not sure, but who really cares when it's so darn cute? I especially like the part (on the right) that reads, "Likes: the sun, painting [and] peanut butter." ...Male? It says "male". What the?